Many crafters start out as people who love to create items that show their personal style. Crafters sell a variety of different products including jewelry, clothing/accessories, glassware, woodworking or holiday items. Success comes from connecting with customers and creating a product that people love! 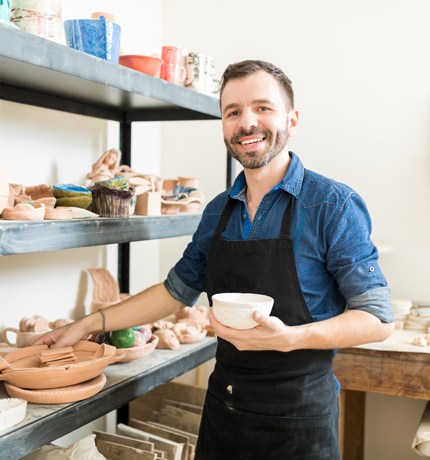 This hobby can quickly grow into a business that provides a source of income for what you do best. Helping you protect your business is what we do best. Protection for someone slipping and falling while in your booth at a craft fair. You could be responsible for any injuries sustained as well as damage to another person’s booth. Protection for your inventory in your home and while at craft shows. This includes theft of your inventory wherever you may be. Protection for the lost income due to your home being uninhabitable. For example, your home has a fire before your peak season and you need to rent temporary space on a part-time basis to complete your products. The extra expense incurred to rent the space on a part-time basis due to the fire would be covered. Be informed - Read all contracts with venues since many venues require vendors to accept liability for things like slip and fall accidents that may be out of your control. Avoid trip and falls - This is the number one exposure for crafters at a craft fair or flea market. Be sure that your area is clear of any and all tripping hazards.